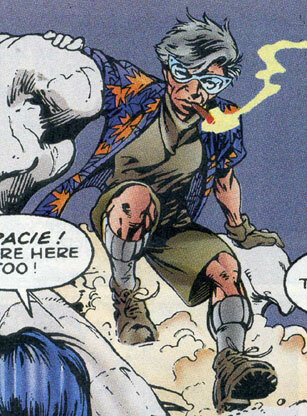 Powers/Abilities: Gracie Destine was a telepath capable of communicating with others by projecting her thoughts into their minds and telepathically erasing the memories of others. She was also a telekinetic, able to unleash massive telekinetic blasts capable of knocking down trees and buried rock. She could channel mystic energy for a variety of effects including the banishment of extradimensional creatures and sealing dimensional rifts. Gracie was also extremely long-lived, having aged only into her elder years since the 1500s. (Alan Davis’ website) – Gracie Destine was born in Yden in 1503. (X-Men & ClanDestine#2 (fb)) – In 1519, during the time when Hernan Cortes and his conquistadors were exploring what would be Mexico, a 16-year old Gracie was smuggled into Cortes’ group as a valet by her sister Cuckoo, who was inhabiting the body of a Spanish nobleman. While Cuckoo and Gracie were interested in learning about the Aztec culture, Cortes only wanted gold and a massive battle broke out among the conquistadors and the Aztecs. During the battle, Gracie was separated from Cuckoo and fled with the Aztecs. Inside the ruins of an ancient Aztec temple, Gracie channeled eldritch energy to enhance her budding psychic powers and despite warnings from an Aztec priest, Gracie felt that she needed more energy to prevent the extinction of the Aztecs at Cortes’ hands. Unfortunately, her powers briefly opened a dimensional rift into the Synraith’s dimension, allowing the Synraith to learn of Earth’s existence. Cuckoo soon arrived, having been alerted to Gracie’s location by the mystic activity, and together the two sisters sealed the rift, preventing the Synraith from accessing Earth. Knowing it would someday return, Gracie dedicated her life to finding a way to stop the Synraith. (Fantastic Four Annual#33 (fb) – BTS) – Gracie met and befriended the man who would one day become the mystic Ancient One. (ClanDestine I#8 (fb) – BTS) – In 1615, Gracie and Albert Destine protected the shogun Tokugawa during a coup in Japan. (ClanDestine II#1 (fb) – BTS) – In 1849, Gracie accompanied other members of her family against the Guild, where they slew four of its members. Prior to the battle, a photo of the family was taken. (ClanDestine I#2 (fb) – BTS) – During a family get-together, Gracie took a photograph of the family. (Fantastic Four Annual#33 (fb)) – Gracie visited the ancestral ClanDestine home of Ravenscroft, where she had tea with Adam, Dominic and Kay. While visiting, a young Vincent (who was secretly being aided in a time travel mission by the modern-day Thing) was heard in the woods by Dominic. (X-Men & ClanDestine#1 (fb)) – In the early modern era, when the Synraith attempted to enter Earth once more, Charles Xavier was drawn to Gracie and Cuckoo’s battle against the Synraith. 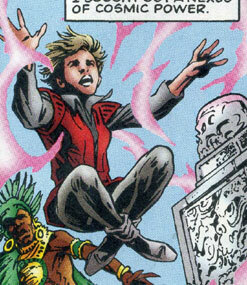 When Xavier arrived, Gracie telepathically welcomed Xavier and asked him to focus his mindblasts toward the Synraith. With Xavier’s help, Gracie was successful in banishing the Synraith from the earthly plane. Realizing that Xavier’s knowledge of the Synraith would make him paranoid of the dangers the world might hold and also make him a target should the Synraith return again, Gracie telepathically erased Xavier’s memories of the meeting. (ClanDestine I#1 – BTS) – Following an attack on the Destine family, Walter Destine revealed to his younger twin siblings Rory and Pandora that he was not their uncle, and that he, Florence, Gracie, Samantha, Kay, Rory and Pandora were all siblings, born of the same parents. He also explained that each of them had superhuman powers and that it was easier to let Rory and Pandora think that their siblings were other relatives due to the vast age differences and their long-lived nature. (ClanDestine I#2 – BTS) – Walter phoned his sister Samantha and explained about the attacks on the Destine family. When Samantha replied that they had to warn the rest of the family, Walter replied that he only knew where a handful of them were, commenting that Gracie was up the Orinoco. Later, Walter, Rory and Pandora visited Dominic Destine on his island and Rory found the old photograph of the family taken by Gracie. 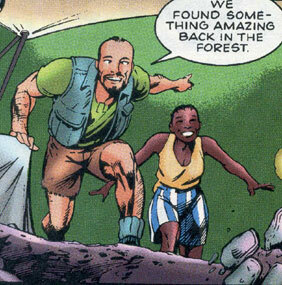 (X-Men & ClanDestine#1) – At an archaeological dig in Venezuela, two of Gracie’s archaeologist assistants found her and explained that they had found something big about half a mile away. Gracie was then led to a large door with writing on it and when her assistant Nick commented that it would take years to evacuate the entire buried complex that the door belonged to, Gracie unleashed a telekinetic blast that uncovered the complex. As her assistants became shocked that Gracie had super powers, Gracie telepathically wiped their memories of witnessing her powers and instead made them think a landslide had uncovered the complex. Looking at the hieroglyphs on the door of the complex, Nick then asked Gracie what they said and Gracie grimly replied that it translated to “The end of the world is nigh.” Noticing that the hieroglyphs also stated that the time of the dimensional alignment signifying the Synraith’s return was imminent, Gracie ventured into the uncovered complex and found the dimensional rift was already forming. Hoping to bar the Synraith’s entry into the earthly plane, Gracie drew a pentagram onto the ground and began an attempt at sealing the dimensional rift. Instead of sealing it, the rift began feeding off of the eldritch energy used in Gracie’s spells and Gracie realized she had been tricked. (X-Men & ClanDestine#1 – BTS) – Gracie was quickly captured by the Synraith as it prepared to enter the earthly plane. (X-Men & ClanDestine#2) – Having secretly been pulled into the X-Men’s Danger Room (disguised as the Synraith’s own dimension), Gracie soon introduced herself to the other captives: Professor Charles Xavier, Colossus, and her relatives Cuckoo and Adam Destine, by explaining that it was she who erased Xavier’s memories of their earlier encounter. She then revealed to Xavier that she had done so hoping it would protect him from the Synraith’s eventual return and she deduced that the Synraith had brought herself, Xavier and Cuckoo there to keep itself from being impeded. The captives then decided to try to defeat the Synraith before it could completely cross over into Earth and as they traveled toward the Synraith, Gracie revealed her part in the Synraith’s knowledge of Earth. Upon finding the Synraith, Gracie explained that the Synraith needed them alive to complete the dimensional rift and give it full access to Earth so the best way to stop it would be to anchor it to its own dimension. Gracie, Xavier and Cuckoo then began their attempts to psychically and mystically anchor it to its own realm while Colossus and Adam Destine attempted to injure the creature. Eventually, Gracie noticed that their fight was going too easily and, remembering its earlier tricking of her, began to question why the demon would allow her to anchor it. Xavier quickly deduced that the captives were actually inside the Danger Room and that the Synraith had made them think they were in its dimension, hoping that the captives would instead anchor it to the Earthly plane. Dispelling the Synraith’s illusion, Gracie and the others noticed that the Synraith was actually wedged within the dimensional rift. Using their powers to hold it there, Gracie, Xavier and Cuckoo allowed the Synraith to be destroyed when the dimensional rift closed and imploded. Following the battle, Gracie thanked Xavier for his help and Professor X asked Gracie what she would do, now that her 500-year quest to stop the Synraith had ended. Gracie replied that perhaps she would go into psychoanalysis or stand-up comedy, or combine the two by psychoanalyzing her own family to provide material for a comedy act. Gracie then departed the X-Men Mansion with the other Destines. (Fantastic Four Annual#33 (fb) – BTS) – After the mystic Dark Ones opened a temporal rift near Ravenscroft, Gracie and Albert Destine projected their astral forms there in an attempt to seal the rift. (Fantastic Four Annual#33) – Doctor Strange arrived with the Fantastic Four’s Thing and Human Torch in an effort to repair the temporal rift. Despite attempts by Gracie and Albert to warn the heroes of the temporal rift, Doctor Strange, the Thing, and the Human Torch were flung through time, arriving at various points during the lifetime of the now-deceased Vincent Destine, who thought he had summoned them at various points in his life. Eventually managing to return to the site of the temporal rift, Doctor Strange was told by Gracie that the Dark Ones had attempted to delay Strange’s repair of the temporal rift by generating an illusory Vincent to distract Strange. Gracie and Albert then helped Strange pull the Thing and Human Torch back to the rift site before mystically sealing the rift. Having witnessed Vincent’s death in the past, the Thing began questioning Gracie and Albert, and Gracie explained to the Thing that they were also the good guys, having arrived before them to repair the rift. With the rift now sealed, Gracie thanked Doctor Strange for his assistance, exclaiming that he was a credit to the Ancient One, who she had met before he was “ancient.” When the Thing demanded answers as to how the rift was related to Vincent Destine, Gracie replied that it was a mystery and agreed with Albert that knowledge could be a burden. Not convinced, the Thing demanded to know if the ClanDestine had any other secrets that could eventually affect others, prompting Gracie to reply that they did indeed have their family secrets, some worse than others. She then smiled and asked the Thing to take care before returning the Thing, Human Torch, and Doctor Strange back to the Baxter Building, where there existed no physical proof that the rift had ever occurred, other than the memories possessed by the heroes. Comments: Created by Alan Davis and Mark Farmer. While one would think that since Gracie and the other Destines were born with powers that manifested as they got older, ClanDestine would be classified as mutants, but there were several instances within the various mini-series that specifically stated that they were not mutants. Yes, their powers stem from their unique half-human, half-mystical being genetics, but isn’t that why Namor IS classified as a mutant? His powers stem from his unique half-human, half-Atlantean heritage... I classified Gracie as a mutate because of the instances where ClanDestine was stated as not being mutants. Gracie’s birth year and location were revealed by Alan Davis himself on his website at http://www.alandavis-forum.com/. Also, while Alan Davis mentioned that Gracie’s original meeting of Charles Xavier occurred in the late 1950s after the Korean War, due to Marvel’s sliding time scale, that meeting would have to be some time just prior to the modern era. Gracie was not identified in ClanDestine II#1 but was seen as a young girl in a photograph. Her appearance in that issue was later confirmed by Alan Davis himself on his forum. Nick and Lisa were archaeologists working with Gracie in her guise as Prof. Gracie Gamble. During a trip to Venezuela, they uncovered the ancient Aztec temple housing the Synraith. Rushing back to camp, they convinced Gracie to accompany them to the temple, where Gracie unleashed a telekinetic blast to further uncover the temple. Shocked that Gracie had superpowers, Nick and Lisa’s memories were wiped by Gracie’s telepathic powers and they were forced to forget she had powers, instead believing that a landslide had further uncovered the temple. Nick then noticed the hieroglyphs on the temple door and asked Gracie what they translated into, prompting a grim Gracie to explain that they translated to "The end of the world is nigh." 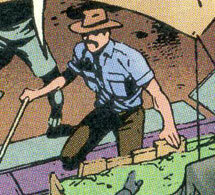 Ramon was another archaeologist working with Gracie as Prof. Gracie Gamble. One of the diggers at the Venezuelan dig site, Ramon was asked to continue digging while Gracie, Nick and Lisa went into the jungle to uncover the ancient Aztec temple housing the Synraith.